La Scuola International School, the first Reggio Emilia – IB - Italian Immersion school in the world, will be running a unique Summer Camp for children ages 6 through 12. Your children will experience both Italian immersion combined with La Scuola's innovative pedagogy combining the Reggio Emilia Approach with real-world skills in English. The camp is subdivided into 4 weekly thematic units led by specialists and artists-in-residence with decades of experience in each one of the thematic units being covered. In addition, children alternate 2 hands-on sessions per day with native Italian teachers providing an immersive Italian environment for the acquisition of a foreign language and the use of the foreign language as a tool for fun encounters! Each week is a mixed-aged format for 6 to 12 year olds. Extended care is available from 4:00PM to 5:00PM. It costs $60 per week. Breakfast, lunch, and afternoon snack are included. Enrollment is on a first-come first-served basis. You will receive enrollment confirmation in January 2018. Changing units is allowed only if there is availability in the desired camp. There are no make-up days in the following week if any individual days are missed. La Scuola is a nut-free school. Although we will try to accommodate food allergies, sensitivities, and dietary restrictions, families may be required to provide lunch from home. Who said birds were the only animals to enjoy building a nest with a view? This summer camp immerses your children in the wonderful world of architecture, taking inspiration from the animal world – from termite mounds to the construction of beaver dams. 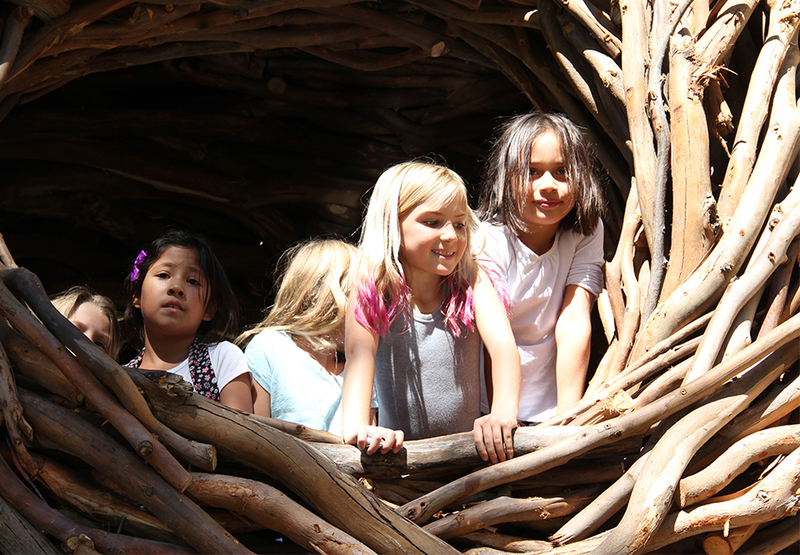 Moreover, children will have the unique opportunity to work with Jayson Fann, a world-renowned nest-building artist. Together, he and the children will test their concepts to build a human-sized nest that is both structurally sound and cozy! Bring your story to life with the Art of Sewing 2.0! This summer camp sharpens children’s storytelling skills in which they write stories and design their own plush characters! Led by Lizette Greco, the mastermind and nimble fingers behind "Grecolaborativo," campers begin by drawing characters and bringing them to life by sewing them into 3D plush toys complete with props. Campers will also write, illustrate, book bind, and publish their stories. By the end of the week, everyone will have a storybook to read and share, plus a plush character with whom they can play and cuddle. Calling all beginning and advanced guitar, mandolin, bass and ukulele players! Maestro Carlo Dean, La Scuola’s Music Specialist, will immerse children in a music-making summer camp to hone their skills in sight reading, technique and musicianship, and apply their music artistry to form large and small ensembles. Supported by our Preschool Music Specialist, Lydia Martín, children also develop chord vocabulary and learn to read standard notation and tablature. Be prepared to enjoy an end of camp concerto to ease you into the weekend! Week 3: Stomp It Up! Join The Bay DIY Movement, as children learn to make one-of-a-kind wind and percussion instruments out of recycled materials and treasures found at the beach, forests, and even the recycling bin! Led by composer and performer David Samas, campers will make Bamboo Woodblocks, Soda Straw Oboes, Box Zithers, Packing Tape Drums, and more! Let's put our engineering hats on because this week is all about inventing, designing, building and testing your own play structures and games for use inside and outdoors! Led by la Scuola's awesome tinkering specialists, campers will use cardboard, bamboo, fabric, and other recycled materials within a STEAM framework to build amazing play structures to climb on, hide under, and run through. A field trip to the Exploratorium will give our campers just the right inspiration to apply new mechanics to their individual creations. An exhibition of the kids' works on the last day concludes the summer camp. Read about our Tinkering Pedagogy.